There's a new Harpur and Iles book, just out in the U.S. Bill James (his nom-de-plume for this series) is at least as prolific as ken Bruen, but a bit more polished--or perhaps the difference is that the Harpur and Iles books are a strict formula. The novels are static, set in a pattern established in the first 6 or 8 novels (Iles only appears in a small role in the first one, though the peculiar sexual and vicious quality of the series is evident even there--what hasn't developed yet in that first act is the oblique patter between Harpur and Iles, and the constant interrupton of the dominant speaker, whether cop or villain, in dialogue with his underlings). The structure of each novel is very interesting, though--not straightforward at all. James focuses on dialogue, rather than action, and he often joins a dialogue in the middle, and after an event that only becomes clear gradually, in flashback or in the context of the conversation in the "present" tense of the book. The "jerky" quality that this process gives the narrative is a perfect complement to the very odd quality of many of the conversations, in which set-pieces that reveal the character of the characters, particularly the barely restrained viciousness of Assistant Chief Constable Iles, are repeated within a book and from book to book. The plot of a particular novel progresses in the background of these conversations and set pieces. In this latest, James departs from his more common formula, involving local gangsters and their attempts to keep up a balance among themselves and with the police in order to keep their trade going at full steam. In Wolves of Memory, the plot involves an informant from London, a sort of accidental supergrass, whose relocation is under Iles's jurisdiction. Iles predictably takes up a predatory pose toward the supergrass's wife, and there is much philosophical parody regarding (of all people) Thomas Hobbes, among others. As is also typical of the Harpur and Iles books, Harpur is closer to what's actually happening, in spite of his almost passive approach to gathering evidence, and the story takes several surprising, even shocking turns. At the heart of the story is the question of identity, and how it relates to real or constructed identity, particularly with respect to the grass's young children, who must unlearn their identities in order to adopt new ones. The struggle of the children achieves a kind of painful, hysterical comedy that is one of the rewards of this series--though the repetitive quality of each novel and of the series can be a little mind-numbing once you've been through James's mill a few times. 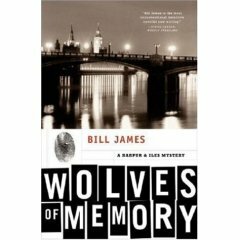 But Wolves of Memory reaches a satisfying, unexpected, even startling conclusion, so stay the course--the darkness and the comedy reach an apotheosis by the end.